Gosh.. I still can't believe that I was cheated and i guess many beaders who frequent this bead shop in jalan petaling have been cheated as well. I'm not mentioning the name of the shop, but it's a bead shop towards the end of Jalan Petaling, opposite ATC College. If you, owner of the shop is reading this post, you should be feeling guilty of your acts and stop telling customers that you are selling to them Swarovski crystals. Phew.. fortunately I seldom use Swarovski crystals :)But still the feeling of being cheated arise whenever i look at them. No wonder when i pour them into the containers, they dun sparkle that much and looks more dull than genuine ones. 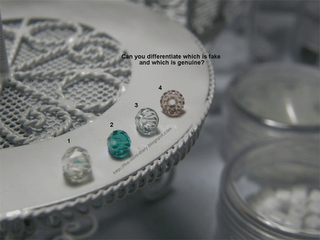 Can you tell which is fake Swarovski and which is genuine? The colours look very similar actually. Look closely, bicone number 1 and 2 does not show its facet cuts as much as bicone 3 and 4 rite? That's because bicone 1 and 2 are fakes!Ok.. what actually happen is this, I was chatting with Steve of Beading.com.my (he was also cheated 3 years ago before he established this shop) . If you guys haven known, this bead shop one of the 2 Swarovski Create Your Style Partners. Means that, they are overlooked and trained by the staffs of genuine Swarovski company. So it started off with just normally chit chat until i told him where i got my Swarovski's from and the cost price. and guess what? He exclaimed that that price is below his cost price!!! Then he so kindly impart his expertise on me. Now i can be expert also d.. hehehe.. After i explain you also can check whether the Swarovski that you purchase is genuine or not. Ok.. i'll explain them from the pictures below. Look at Side B of this green bicone. See properly and you can see the top edge is very much thinner than the bottom edge. The edges are not smooth as well, means they are quite jagged and you can see bumps with your naked eye. Just turn on your table lamp to shine on them. Check the genuine one out. 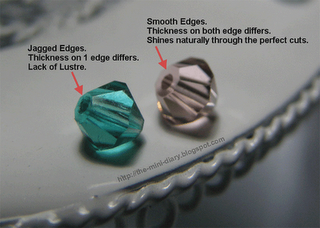 Genuine Swarovski bicones have 2 distinctive thickness at both sides. One side is thicker and one side thinner. However thick or thin, they are regular in size and smooth. This picture shows a comparison of the fake and genuine. Note that the thick edge of the genuine crystal is thicker than the fake one? You can also clearly see the smoothness of it is compared to the fake one.